Monk Zenshin serves up cocktails with Buddhism at the "Monk Bar." Tokyo, Japan (CNN) -- Outside the 400-year-old Kyoouji Temple, Kansho Tagai, dressed in his traditional monk robes, paused and began a sutra. He bobbed his head and then broke into a lyrical rap. "This is an old, old story, a fantasy and longing cosmology. Hey, hey, what's the story about? It's about the Buddha, yo. Hey brother, listen carefully! You got it? No? You don't? Okay, baby, no problem." Tagai, or Mr. Happiness, as he prefers to be called, is delivering an ancient message to a hip hop beat. The monk hosts hip hop shows at his temple, drawing young people to a place that is traditionally filled with the elderly. His hip hop message is so popular that twice as many people now visit his temple. "Buddha's doctrine is a treasure for us," Tagai said. "But we're not able to convey his wisdom to the people if we only stick with the old ways. So I try to use a new way to spread Buddha's doctrine. I want to spread Buddhism to the young by using the language they easily understand. Buddhism itself hasn't changed. It's just the way it's presented." The ancient religion is in crisis, Tagai said, because monks are not reaching the young with a message that brings spiritual relief. The numbers support his fears. Japan is home to 75,000 temples, but those numbers are on the decline. The Japanese Agency for Cultural Affairs reports that since 2000, hundreds of temples have closed every year. Will religion soon be a thing of the past? Younger monks like Tagai are taking matters into their own hands, by trying to attract a new generation of Buddhists. 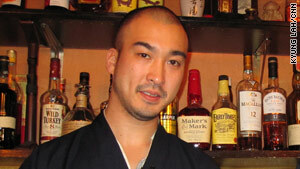 At the Monk Bar in Shinjuku, Zenshin Fujioka shakes up the house special. He pours a drink layered in red, yellow and pink, which he calls "heaven." His other special of the night is "hell," a spicy vodka mix that sticks with you for hours. Never mind that Zenshin is a monk. Sutras are shaken and stirred at the Monk Bar. "There's this image that monks sit deep in a mountain, training alone," Zenshin said. "But it's important that we come down into the secular world and live in modern society. An altar doesn't mean you have a temple. A temple is a place where people follow the faith and Buddha." "This place is a temple," Zenshin said, wiping liquor off the bar. To those who call the venue a gimmick, he said, "please visit my bar before judging." As the bar filled with smoke and patrons one evening, Zenshin paused and rang his bell. The ancient sutras flowed forth, as customers listened. Hardly anyone can follow the ancient Buddhist text, a Japanese that's so complicated, only monks are readily able to understand it. But Zenshin said the real religion happens as he pours the drinks, talking to his guests about their problems and soothing with the Buddhist texts. "Buddhism for Japan is a religion you normally only experience at funerals," said patron Naoyuki Osano, who comes to the bar twice a week. "But the Buddhist philosophy is wonderful. It's great to have a place like this for us to learn about Buddhism."